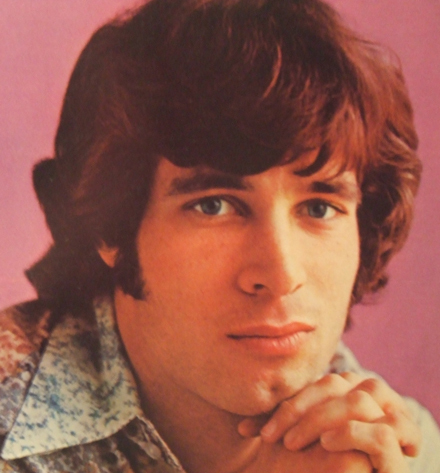 NOTE: I was sad to hear of the passing of actor/musician Don Grady (Agrati) yesterday at the age of 68. Not only was Grady a fixture in America’s living rooms in his role as Robbie Douglas on the long-running sitcom ‘My Three Sons’, but he was also an accomplished musician with connections to the Sunshine Pop world. This is a re-up of a post I first published about 18 months ago. 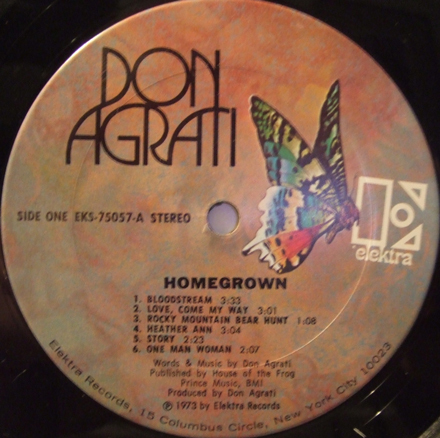 It features two songs from his excellent 1973 LP “Homegrown’. I hope you dig the tunes, and I’ll see you all on Monday. The 2012 Pledge Drive was a big success. I know that some of you that hit both Iron Leg and Funky16Corners dropped some cash into the virtual tip cup, so I send you my thanks. The tune I bring you today is, despite its major-label-osity, almost a complete mystery. 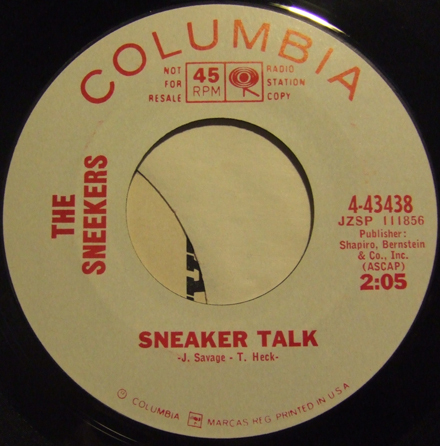 I don’t remember when I picked up the Sneekers, ‘Soul Sneaker’ b/w ‘Sneaker Talk’ but I think it must be obvious why I did. How, I ask you, could any digger/fan of music flip by a 45 like this and not put it in the keeper stack? As far as I’ve been able to tell, the Sneekers 45 was released in 1965, but aside from that, little else in the way of hard facts have turned up. The band – I’m assuming that the folks on the sleeve are in fact The Sneekers – have an oddly retro look for 1965, with the bow ties, suits and short haircuts. While ‘Soul Sneaker’ is decidedly non-soulful, ‘Sneaker Talk’ has a kind of wild, beat-era rave-up feel to it. The guitarist is especially good on both sides of the record. While the lyrics are the kind of inane, dance-craze boilerplate that Brill Building/Tin Pan Alley cigar-chompers seemed to be rolling up and tossing out the window on an hourly basis (could they perhaps been a commercial tie-in done on spec? ), the group is musically quite good. While I wouldn’t describe the sound as garage-y, it is definitely butting up against the border of those kinds of sounds (imagine ‘Sneaker Talk’ with some fuzz guitar or organ). Interestingly, the Ugly Things comp database lists a few other tracks by a group called the Sneekers, based in the UK, two of which were included on collections of Jimmy Page’s session work. I have no idea if this is the same band, or if Page played on these tracks, but the R&Beat sound certainly screams UK to me. If any of you good folks have anything to add/confirm, please do so in the comments. Before we get started I want to let you know that this is Pledge Week over at Funky16Corners (aka the mothership). I always put out the tip cup about this time every year to raise money for the server costs related to Funky16Corners and Iron Leg. If soul and funk is a bag you’re in, there are close to 150 mixes and another 110 or so radio shows posted in the archives at Funky16Corners. If you’re solely an Iron Leg-ger, there’s lots to pour into your ears over here as well, with the Iron Leg Digital Trip Podcast Archive as well as the Iron Leg Radio Show. If it’s something you find valuable in any way, please click on the donate link over at F16C. This month’s Iron Leg Radio Show sees us back around the 90 minute mark, with some garage, freakbeat, worldbeat, a tribute to Robin Gibb, some tunes by Biff Rose and a very long set of sunshiney pop. 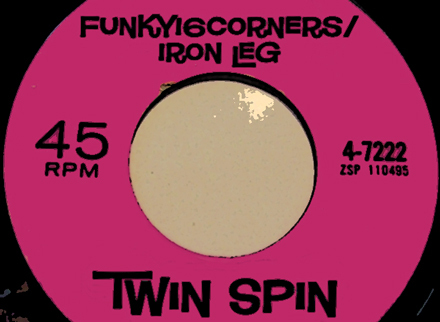 What I bring you today is an updated version of what I used to call the ‘Intersection of Iron Leg and Funky16Corners’ now rebranded (cough…) as a ‘Twin Spin’. If you head over to Funky16Corners, you’ll get smacked in the head by the brilliant 1965 Ted Taylor version of ‘(Love Is Like a) Ramblin’ Rose’. This is the self-same tune that a few years later was positively “blowed up” by the only Motor City Madmen that ever mattered, the MC5. Now, earlier this year, my man Derek See over at Derek’s Daily 45 dropped another version of this song, which as soon as I heard it I knew I had to get myself a copy to stuff into my record box. 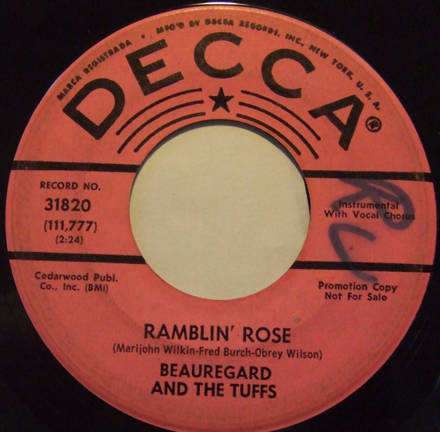 That version – which you see before you today – was recorded by a combo named Beauregard and the Tuffs. Other than the fact that it was also recorded in 1965, and inspired by the Ted Taylor version (as opposed to the 1962 Jerry Lee Lewis recording) I can tell you absolutely nothing about Beauregard and the Tuffs. No matter how hard I’ve searched, I have been able to turn up nothing about them (though you’d think with a name like that, something would show up). Other than the band name, and the writing credits, there is no further identifying information on the label that might point a curious soul like myself in a new direction (the flip ‘Big Bad Guitar’ is a cover as well). The Beauregard and the Tuffs recording is a fantastic example of early, UK R&Beat influenced US garage, with the fuzz guitar, organ, harp-monica and pounding, troglodyte drums. The guitarist of the group is particularly interesting. 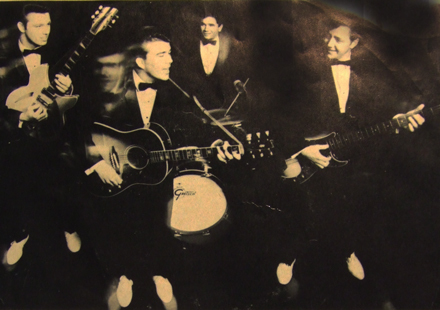 I make the determination that they were ‘covering’ Ted Taylor, not only because of their adaptation of the falsetto lead, but because their 45 also carries the appended writing credit of Obrey Wilson, which seems to have originated with Ted Taylor’s Billy Sherrill-produced Nashville session. That all said it is indeed an exceptionally groovy record, and I hope you dig it (and pop on over to Funky16Corners if you haven’t yet dug the Ted Taylor). See you next week with another episode of the Iron Leg Radio Show. I hope all is well in your corner of the world. Once in a great while, in the midst of music acquisition, one stumbles upon a record that seems to have become wedged in a forgotten fold of the universe, that when shaken free reveals itself to be a forgotten gem. The records I bring you today are that, and then some. I can’t recall how I stumbled upon ‘Silver Sea Horse’, but I suspect that it was during a routine browse through a list of records for sale that had been brought to my attention. Though I consider myself a huge fan of Jerry Leiber and Mike Stoller, and someone who has plumbed the depths of the less obvious catacombs of their ouvre, I had never heard of the Stoller System. Once I saw the record (it only cost three bucks) I pulled the trigger and awaited its arrival in the old mail slot eagerly, not expecting a whole lot, yet knowing that when it came, no matter what it sounded like it would slip another leaf into great book of Leiber & Stoller-iana. So, the disc shows up, and I slip it under the needle, and within a few short seconds, it became immediately obvious that this was one of those rare discs that seemed to have been engineered with a map of the pleasure centers of my brain at hand. There, in just hair over three minutes, was a forgotten (unjustly) slice of a musical zeitgeist so wonderful, so able to bring to mind the very essence of a very specific time, that I was transported, listening to it over and over again at least half a dozen times. 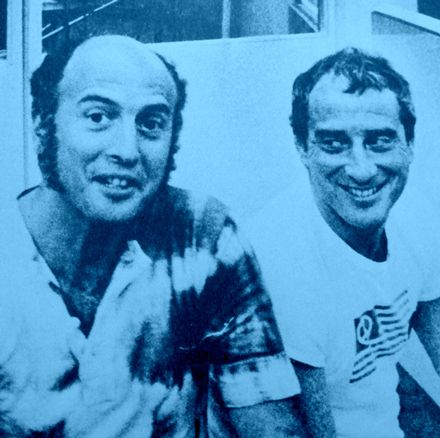 The likelihood that the Stoller System was anything more specific than a group of studio musicians put together by Leiber and Stoller to bring this music to life is very slim. There were two singles released under than name on the Amy label in 1968, comprising a total of four songs, all instrumentals. Other than that, there is little to no information out there on the project, other than listings in Leiber/Stoller discographies. The material I’ve heard (my 45 of Silver Sea Horse is a two-sided, mono/stereo disc) is all interesting, falling into the wide category of mood music with a leaning – at least to my ears – toward what one might expect to find on a TV or movie soundtrack of the day. ‘Silver Sea Horse’ is – in a word – magical. 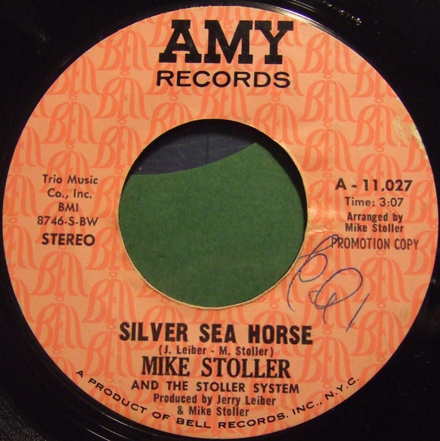 Credited to ‘Mike Stoller and the Stoller System’, with arrangement by Stoller and production by Leiber and Stoller, ‘Silver Sea Horse’ sounds like the result of dream session in which Burt Bacharach, Vince Guaraldi and Herb Alpert came together. Featuring a wonderful, hook-laden melody, delivered with smooth brass, electric harpsichord and subtle Latin percussion (dig the cuica!) 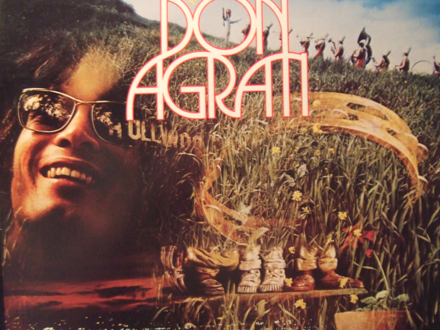 it’s not too far off the mark from Bacharach pieces like ‘Pacific Coast Highway’ or ‘Nikki’, or some of the later, non-Peanuts instrumental music that Guaraldi was doing for Warner Brothers. 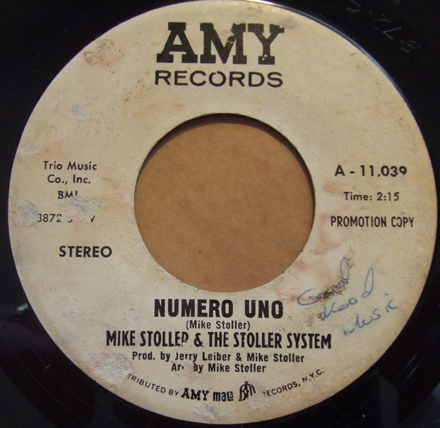 The second track I bring you – ‘Numero Uno’ – comes from the only other Stoller System 45. This track is also – perhaps to a slightly lessert extent – a pastiche of spy/suspense themes, also sampling liberally from the bushel basket of musical signifiers, including booming timpani, martial snares, piccolo trumpet (or something like it) wrapped in an upbeat, mod theme. Standing side by side with ‘Silver Sea Horse’ it almost sounds as if someone had challenged Stoller to come up with these themes to purposely emulate the sounds mentioned. He (and Leiber) clearly had an “ear” for such things, so good in fact that both of the tunes posted here manage to conjure up their respective “worlds” without sounding kitschy or parodic. I don’t know if any of the four tracks were just a small, ‘vanity’ exercise for Stoller, or if they were perhaps repurposed from some forgotten project. If anyone knows, please pass along the information. I hope you dig them as much as I do. 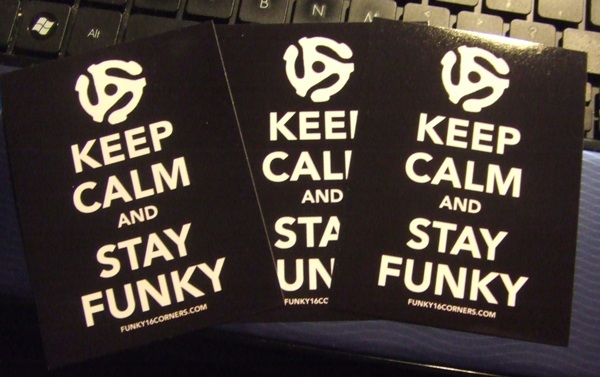 The stickers are 4″ x 3″ and printed on high quality, glossy stock. ($2.00 per order shipping outside of the US).